A SPECIAL Olympic athlete, a carer for HIV sufferers, and an inspirational school governor were among those hailed as Camden’s heroes. 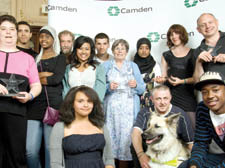 The outstanding achievements of residents were celebrated in this year’s Exceptional People in Camden awards. The ceremony in Camden Town’s Koko was hosted by TV personality Paul Ross. Sean Canavan, of Ryland Road, has not let blindness stop him from improving Kentish Town with plants and flowers and extra litter collections. He was honoured for his Exceptional Contribution to the Environment. Helene Reardon-Bond, chairwoman of governors for Rhyl Primary School, was praised for her work with young people, while Special Olympics bowling pro Lucy Collins picked up the Sport and Leisure award for her tireless efforts with adults with learning disabilities. Exceptional carer went to Greg Branson from the HIV Charity Helios in King’s Cross, and the Exceptional Young Person award was shared by members of the Youth Opportunity Fund Panel, who give grants to disadvantaged groups. Mike Stuart, chairman of the Kilburn Safer Neighbourhoods Community Panel, was recognised for improving community safety.